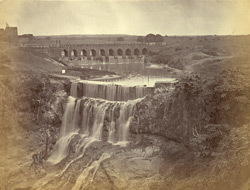 Photograph of the waterfall at Ajanta from the Allardyce Collection: Album of views and portraits in Berar and Hyderabad, taken by Robert Gill in the 1860s. The old town of Ajanta is situated 8 km to the south of the famous Buddhist cave temples of Ajanta, situated in a horse-shoe valley of the Waghora River. The caves were in use for about eight centuries, and can be divided into two groups according to the early Hinayana and later Mahayana phases of Buddhist art. The first group was excavated between the 2nd-1st centuries BC. After a period of more than six centuries, the excavations restarted around the 5th century AD, in the Vakataka period. The town of Ajanta is surrounded by a strong fortified wall and moat built by the Nizam in 1727. This view shows the bridge leading to the fort and the waterfall that it traverses.